A great upgraded solution that actually makes your ZF Rover transmission fluid change much easier to complete than using typical OE Land Rover process! This kit includes the Original Equipment Land Rover filter. Worn transmission fluid leads to judder, noise and a deterioration in gear change quality. ZF recommends oil and filter changes after 50,000 to 75,000 miles on all 5, 6 & 8 speed automatic gearboxes, to ensure optimum performance. These are improved and easy change filter conversion kits for all vehicles using the ZF 6HP26 automatic transmission - LR3, LR4, Range Rover Sport and Range Rover Full Size L322 models. The standard fluid and filter change process from Land Rover is a very lengthy process. The sump and filter are normally one piece and fitting involves jacking the engine up and unbolting the mounts, plus the removal of the exhaust. The fitting of this kit is far easier. Once the fluid has been drained from the transmission, simply remove the bolts from the old unit and cut the old plastic sumps filter tube with a hacksaw. Slide the old sump out and remove the other end of the sawn-off filter tube. The new separate filter can then be fitted and the new sump pan slides into place and is bolted up with the new gasket supplied. Once secure the transmission can be filled as per manufacturer’s instructions. The new sump pan also has the added benefit that it is manufactured in durable steel rather than the plastic of the original OE pan. Additional kits available with choice of a quality aftermarket filter and all the ZF Lifeguard Transmission Fluid you need for a complete service replacement - see alternative items. Watch Doug, our Land Rover Master Technician, take you step-by-step in the removal and installation of the Transmission Filter Conversion Kit on a 2005-2009 LR3. Using kit # ATFCK, this is an easy change filter conversion kit for all Rovers using ZF 6HP Automatic Transmission. This includes the LR3, LR4, Range Rover Sport and Range Rover L322 models. Installing the original factory filter change kit is a very lengthy process. The original sump and filter are normally one piece and fitting involves jacking the engine up and unbolting the mounts, plus, the removal of the exhaust. This new kit has a two-part filter and pan design, which makes installation much easier. Doug will also address replacement of the Automatic Transmission Valve Body Sleeve part number TZV500010G which has a tendency to leak. It is recommended that this sleeve be replaced while you have the pan down. This service is recommended to be performed every 50,000 to 70,000 miles to ensure optimum performance. Thanks to Doug on the video.Apainstaking project!!???????? All worked well,yes I would recommend to others,would suggest watching video very closely. the pan kit shipped ultra fast and arrived well before I expected it. 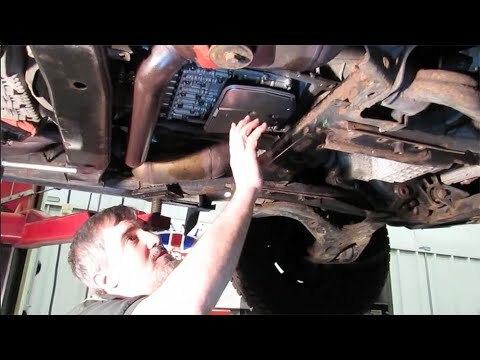 easy procedure to install the new filter/pan thanks to the AB video. The removal of the old single pan/filter was a pain and cutting the filter neck off was difficult to say the least but not the fault of AB. The new pan went in much easier then the old one came out! Only suggestion would be to update the video to show the use or need of a tap to clean out bolt holes, which is recommended on the product information sheet. I used a drop cord and rear view mirror to locate and view the plastic shaft, to assist with job to hacksaw it off. Also suggest buying a heat retarding foil/felt sheet to cover up the catalytic converter pipe. Very awkward/dangerous/confined space, while trying to re-seat the fill plug in a hot engine. Reading the other review I wonder if they are talking about a LR3 or something else. I am an accomplished mechanic although I do not turn wrenches for a living. With that in mind, I took far longer than an hour just to remove the heat shield that covers the transmission oil pan. There are 4 8mm wrench size bolts that need to be removed to access the pan bolts. Two are extremely close to the drive shaft and the shift cable. There is no way to get a socket on either of these and the bolt near the driveshaft is too long to fully disengage from transmission without prying the you-know-what out of it. And if you want to put it back in.....good luck. They only allow 700 chrctrs? Lots more to say! Very easy to install, blows the oem kit out of the water. Fantastic! It made a long and difficult job very simple. 1 hour of work time only. Followed procedure in the video, but didn't find a need to jack the transmission by using some improvised tools. Needed a T-25 or T-27 (can't remember) for my 2005. Very straight forward. HUGE improvement in performance. My leaky pan meant I was low on fluid. Rough and slow shifts, transmission slipping or surging. Fluid came out black. After change noticed remarkably better shifting that has gotten even better over the past couple hundred miles. Kit was complete and very easy. Only gotcha with the pan is one bolt is very close to the pan lip, so you need a very thin walled socket to fit. I did what I could with the socket and box wrench I had and am hoping its good enough. Great kit!